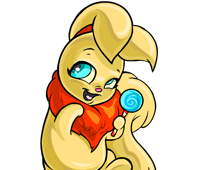 My name is Tenshinoyume, Tenshi for short, and I came to tell you how wonderful my petpet is. He is Moondrops, the Doglefox, and not only he is special physically but also spiritually. We have taken care for each other since the day my mommy gave him to me many many months ago, we played the entire day as we flew around Neopia, of course, I hold him on my arms the entire time, you know, Doglefox aren't supposed to have wings. A month ago tragedy hit us and I got sick. There was no know remedy on the Neopian hospitals and Pharmacies, The doctor said my condition was more like a course than a sickness, and unfortunately it parted me from Moondrops. Mommy was freaked, she tried to pretend security, doing her best to make me believe everything was alright, but I knew the truth, that not even her magic could help me, and that Moondrops, wasn't allowed into my room, or anyway near me, as his presence somehow seamed to aggravate my condition. It was so sad it parted our hears, mine, mommy's, and Moondrops�s. Since my mommy had to be with me full time, and my sisters already had a petpet to look after, she had to gave it to my brother Kaylidar, but he didn't wanted him. He will never accept it, but he has been afraid of him since they first saw each other. So, the time I were sick, I spent days and nights on my room, meanwhile Moondrops shared my torment as he spent every hour on the backyard looking up at my window, he wasn't physically by my side, but our souls were never a part. Moondrops told me, that one night he looked up to the starry sky, the one we used to cut through, and wished upon a star for help, for a cure, for an answer, and then felt asleep. In dreams he saw a faerie, one that he couldn't identify, as she wasn't Fyora, nor Funah, she wasn't the space faerie not even the light one. She then spoke, her voice, as Moondrops managed to describe with his expression, was soft and sweet. She commanded him to cure me, that only him, that little Doglefox full of faith and good wishes could do so. She told him where to go and what to search for. There's a place on the were no other petpet has ever gone, before, were the days are black and the stars always shine, where the most beautiful flowers are born, is the place where dreams are conceived, on the other side of the world." When he woke up he saw a crystal on the floor, some kind of ice, and he knew, it was a clue, since the first place to look for such a mysterious place was terror mountain valley. He went thru streets alone, and afraid, and being my only hope he never stopped. One of his pranks was getting into a ship that could take him to Terror Montain, (unfortunately it took him to Krawk island instead). And after running away from the a mad cook on the Golden Dubloon, he slip into another ship, this time a pirate one. As friendly as he is that didn't make a big problem, and finally they changed they're course and left him near happy valley, where, as he told me, the real troubles began. He went into every corner of happy valley, but no one could understand what he was looking for (you know, I'm the only one who can understand him) Except for Tyrela Softpaw. Tyrela: I Heard, little doglefox, that you are looking for something on this mountain. Moondrops nodded, and described to her that magical place, where the days are always dark, and the stars always shine. Tyrela: I can tell you where to find it, but you must understand, that in order to get there, you'll have to risk you own life... Are you sure it is worthy. Moondrops nodded again, knowing that I, would have done the same for him. Following Tyrela's instructions, he went into the snowagers' cave, carefully slipping to the bottom, since the entrance was behind him. He passed thru Neggs, weapons and novas, without taking a thing. He finally found the entrance, but it was dark and scary, and inside the darkness of that place he felt into a hole, breaking thru barriers that released sparkles around him. When the barriers stopped he found himself falling meters and meters until a tree stopped his fall, saving his life. When he recovered, he saw the place he felt into, and looked up into the sky, where the stars shined even during the day, around those beautiful trees there were flowers, many of them of every color of the rainbow. But on the top of a hill, all alone was a flower, with the shape of a star, and bathed by the moonlight. Something told him, that that was the cure he was looking for. When Moondrops came back he was holding the flower on his muzzle, he was dirty but still there were sparkles all around his body that wouldn't fall not even with shampoo. My mommy saw him and then the flower. When she hold it she knew there was some magic on it, and that that magic was the blessing I needed. Mommy placed it on a jar beside my bed, and during night, I was cured. When she woke up the next morning I was already on the backyard playing with Moondrops, as happy as I could be. In order to pay him for all his effort, my mommy blessed Moondrops with the gift of Flight, giving him beautiful wings the ones he use to fly with me among the stars, where he shines like if he was one of them... and at some point, and for me... he is, and the hero that saved my life.